General Hospital Recap: Griffin Loses His Mind And Leaves Town! 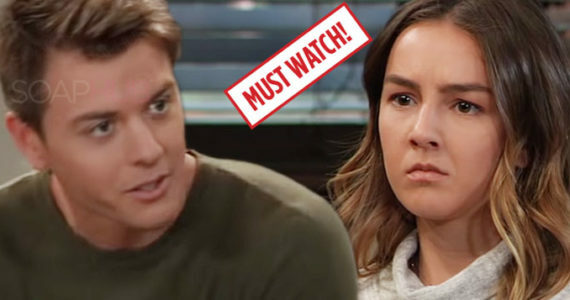 The General Hospital recap for Friday, March 22 features Griffin’s ultimate fall from grace as he hits rock bottom. No, it wasn’t Ryan (Jon Lindstrom) who decked Kevin out of nowhere on the pier. It was a very angry Griffin (Matt Cohen), who’d pretty much had it with everything at that point. He seemed pretty intent on killing Kevin, but then Ava (Maura West) came along and stopped him. She was shocked when Griffin said he knew this wasn’t Ryan, but that Kevin had known Ryan was alive since last year. She still told him Kiki wouldn’t want him to have blood on his hands. Since he literally did have blood on his hands, he meandered back to the hospital where Lucas (Ryan Carnes) treated him and Griffin lamented life and all that’s happened to him since he arrived in Port Charles. That was it for Griffin. He was done. He resigned from the hospital, told a shocked Sonny (Maurice Benard) and Carly (Laura Wright) goodbye, and left. Um, see ya, Griffin. Back at the pier, Ava and Kevin chat and she told him she knows what it’s like to think you did the wrong thing for the right reasons and then have people die because of it. Then, Kevin was arrested because the cops mistook him as Ryan.